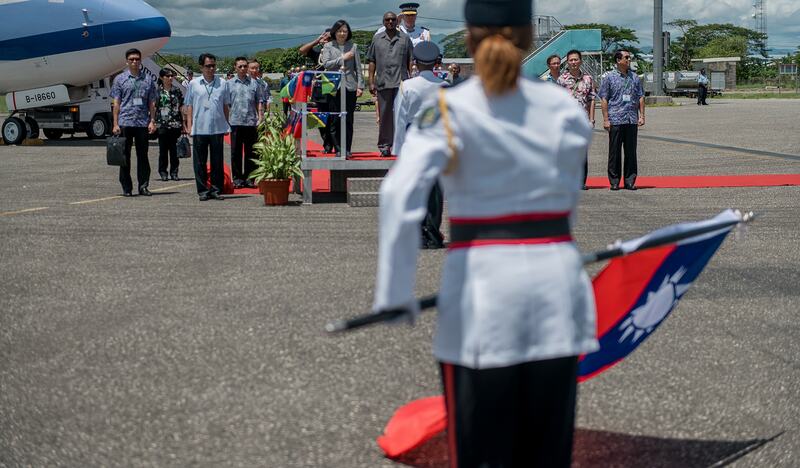 With fleeting news coverage, President Tsai Ing-wen of the Republic of China last month concluded official visits to Marshall Islands, Solomon Islands and Tuvalu, three diplomatic allies of Taiwan in the South Pacific. No surprises occurred during her South Pacific trip, which was based on Tsai's 'steadfast diplomacy' programs – although there was an intriguing announcement during a transit stop in Hawaii. Taiwan's aid has made an impressive contribution to the development of the three Pacific nations. Despite not having the status to participate in the UN or in most regional intergovernmental mechanisms, Taiwan has shown a willingness to serve a responsible role in the region. The launch of 'viable diplomacy' during Ma Ying-jeou's presidency, guided by Taiwan's White Paper on Foreign Aid Policy released in 2009, rebuffed views of Taiwan as a 'cheque-book diplomacy' player. Little has changed with the aid approach of the Tsai administration. Taiwan has forged a special bond with these countries over some 20 or 30 years of friendship. This was demonstrated in 2009 after Typhoon Morakot killed more than 700 people in Taiwan and Tuvalu made a donation to the recovery of US$210,000 – then around 1% of Tuvalu's GDP. In another moving gesture at the time, a village in Solomon Islands raised a sum equivalent to approximately US$126 and made a 24-hour journey to deliver the donation directly to Taiwan's agricultural mission in Honiara. Yet despite this evident good will, surveys show the Taiwanese public has reservations. Most believe aid to Pacific nations and Taiwan's allies is a waste. In Taiwan, unfortunately, the South Pacific allies have often been portrayed as 'poor, small, and black' countries coveting Taiwan's money. It is undeniable that part of Taiwan's effort in this region has been focusing on winning official recognition while under pressure from Beijing. Each of the countries Tsai visited spoke in support of Taiwan's desire for meaningful participation in the UN. But it seems that one Taiwan ally is wary of Tsai. Palau has sought closer relations with Beijing after a breakdown of the tacit 'diplomatic truce' between the two sides of the Taiwan Strait in spring 2016. A high-ranking official of Taiwan admitted that one of Taiwan's allies in the South Pacific was 'a little impish' in bargaining with Taiwan for more financial aid, which appears to be a reference to Palau. In late November, another high-ranking official of Taiwan confirmed the speculation, stating that Palau has been 'a case of some delicacy'. The Beijing authorities did not oppose Tsai's visit to the south Pacific; mainland China has not openly attempted to intervene in Taiwan's engagement with its 20 allies. But Beijing did see 'little tricks' at play when Tsai made transit visits to Hawaii on her way to the region and to Guam on her way back to Taiwan. The US described the transit as 'private and unofficial' but the authorities in Beijing lodged complaints with Washington about Tsai's transits. As in most cases, the US has remained independent in accepting or denying Taiwan's request for transit, regardless of mainland China's opposition and protest. What baffled many in Taiwan was Tsai's decision to make a transit stop in Hawaii, a US island that is not on the way from Taiwan to the South Pacific. This made Beijing doubt Tsai's real purpose. In Hawaii, she announced a boost to Taiwan's annual defence budget of at least 2%, and 3% if the arms acquisition requires – an announcement that appeared to be made with the hope of getting into the good graces of the Trump administration. As a token of appreciation, presumably, the US agreed to Tsai's request to transit in Hawaii. Tsai's positive gesture in Hawaii towards a US arms sale to Taiwan was possibly also intended to act as a firewall against the small chance that Xi Jinping pushed Trump to reach a consensus that would be unfavourable to Taiwan. For their part, Taiwan’s South Pacific allies care little for where Tsai makes transit stops and what she says en route, instead prioritising the continuation of Taiwan’s aid programs. But the potential appeal to engage with mainland China’s Belt and Road Initiative for developing allies demonstrates how Beijing can complicate Taiwan’s attempts to maintain diplomatic ties in the region.